These are photos I took on Thanksgiving Day. Nitro is doing great. He is getting many of his "signs" down but you do have to get his attention before you can sign to him. He has gotten the sign "go potty" down pat. It helps that he hates the cold so he does his business right away. We've only had two accidents since Saturday and none in the past two days. His crate training is going so well. I wrenched my left shoulder yesterday so that forced me to leash train him last night with treats to get him to walk out of his crate and straight to the door to go potty (I had been carrying him because I was worried he would stop and squat in the house before we reached the door). So by hurting my shoulder it forced me to go to the next step in his training and he passed with flying colors. This morning he even went back to bed after breakfast. I got up at 2AM, 5AM for potty breaks and breakfast and we all went back to bed until 7AM. I feel like a new person to finally get some sleep! We will take him everywhere we go for the next month or so to get him socialized. He is such a good boy! I love my little Nitro! We took Nitro to Field Of Dreams Pet Training Center for their Christmas Open House to look at their facility, meet the trainers and also get a photo of Nitro with Santa. We had a great time and we met a lot of other people who go to F.O.D's and their dogs. It ended up being a great opportunity for Nitro to start meeting other people and socializing with new dogs. Below is a photo of Nitro sitting on Santa's lap. Nitro had his first training session at Field Of Dreams Pet Training and Agility Center and he did very well. We worked on eye contact, coming, sitting, and recall for Nitro to go back and fourth between two people. I was so proud of how well he paid attention. I have high hopes for his future. He is fitting in nicely here at Bluebird Farm and he has especially taken to the couch. He is 100% couch potatoe which is very good because it means he has a very "laid back" personality. Merry Christmas from Lexi, Tallulah, Bailey and Nitro! 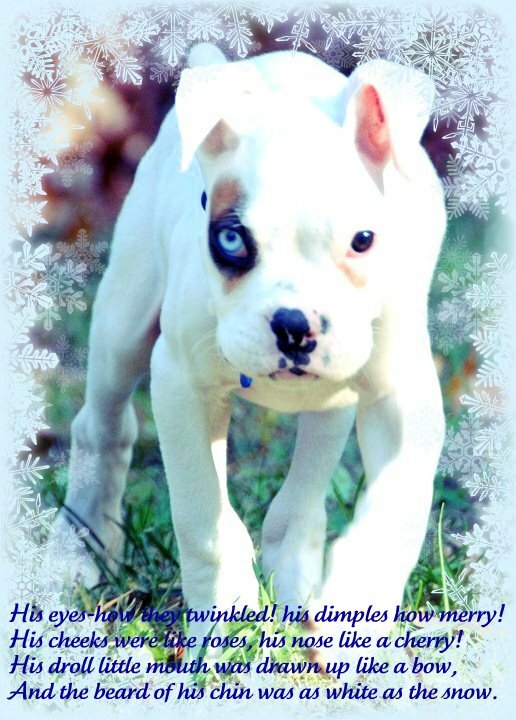 Nitro's latest "Winter Wonderland Christmas Greeting Card" ...Merry Christmas everyone! Below is a photo of Nitro taken today. He has gone from 14 pounds (when we got him) to 25 pounds in just 3 weeks. He is going to be a big boy! What wonderful news that Nitro is doing so well! Good job on training that boy! He is cuter everyday. Where did you get the signs for doggie training? We are looking forward to following his progress. 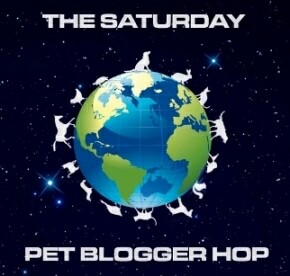 PeeS: Thanks for visiting our blog! Thanks all! @ Minnie and Mack. We learned signs on line on You Tube. There are several videos to get started. I watched one about 15 times until I got about 60 signs down and then some of them are my own. We try to use some ASL signs and mix them with dog signs. He's sooooo awesome! We have a boxer pup. He's now 6 months old and such a great personality. Thank you for adopting this VERY special little guy, I'm sure he will thrive in his new life in your home. He is soooooo adorable and you all are doing a terrific job! He has hit the lottery! I love the blog, Christina.